All the useful information that you need to know before sending money with Money2anywhere! Launched in the year 1980, Money2anywhere is a money remittance company with headquartered in Abu Dhabi. The company has been owned and operated by UAE Exchange, a leading global company. One can transfer the funds from 10 countries, mainly including Qatar, UAE, UK, USA, Australia, Canada, etc., to anywhere in the world through bank-to-bank transfer or cash pay-in payout. The company only offers personal transfers, so, there is no minimum and maximum limit to send the money. One can send the amount they want to send through phone or online, ACH and agent transfer. Depending on which country you’re sending money from, you can also pay Money2anywhere by debit or credit cards as well as bank transfer. The company is providing 24*7 customer care support, and you can contact them through phone or email. It’s round the clock operations and customer service makes it a competitive company amongst other money remittance companies. Money2anywhere is also safe as it is using highly encrypted protocol certificate to keep high privacy procedures. On an overall basis, we rate 8 out of 10 to Money2anywhere. Pricing : How much does Money2anywhere cost? The company offers specific fee according to the country you are sending money to, which will be shown on the transfer page. One has to pay approximately $1 to $10 accordingly to the country. It also provides a 20% discount to Australian customers on bank transfers. The company offers competitive exchange rates, which will be shown to the customers when they start the transaction. This rate will gets locked after login, and the same will be received by the recipient. However, this rate will be lower than the live market rates while many other competitors offer live mid-market prices for the transfers. 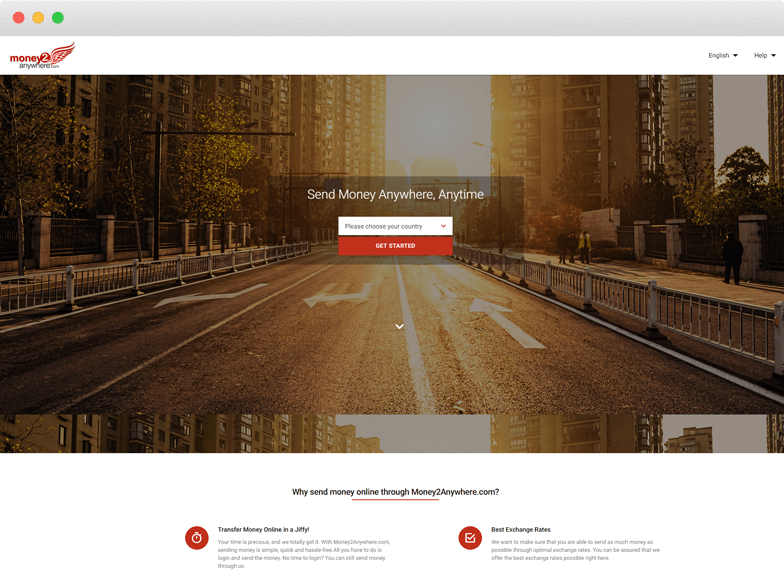 Money2anywhere online money transfer does not have any other fee, so one can trust the company regarding their transfers. On an overall pricing scenario of Money2anywhere, the experts of Exchange Rate IQ have given the score of 7 out of 10 to it. Transparency: Does Money2anywhere have any hidden fees? The company does not have any hidden fee. The recipient will receive the amount that has been paid by you and shown on the dashboard. The users can track the details of transfer on their dashboard on the mobile app and website. The company will provide a 16-digit transaction reference number or XPIN which you can find at the top right corner of the payment receipt. Besides this, the company does not have any minimum or maximum transfer limit; so, one can send the funds without worrying about the daily or yearly limit. The company has no hidden fee and excellent tracking procedure; therefore, we rate 10 out of 10 to Money2anywhere for its transparency. Transfer Speed: How long does it take to send money through Money2anywhere? The company does not offer instant transfers. Customers who are transferring funds through Money2anywhere should have to wait for 3-5 working days to reach the money to the recipient. Most money transfers from Money2anywhere get credited within 2 to 3 business days, but it depends on the countries you’re sending money from and to as well as the pay-in method. The company has launched another product naming, FlashRemit which allows an instant transfer, real-time credit to most bank accounts. Though this product is available only for bank-to-bank transfer and payout options include cash pick-up from a Moneydart agent’s office (instant), or direct deposit to the recipient’s bank account (1 day). Many other competitors of Money2anywhere offer instant transfers, while it is taking 2-3 days. Therefore, we rate the company 7 out of 10 for its transfer speed. Security : Is Money2anywhere Safe? The more use of mobility, online transactions and related trends have made everyone to rethink about the cybersecurity and designing the privacy, but you can stay worry-free while transacting with Money2anywhere. The company uses 128-bit Secure Sockets Layer (SSL) encryption technology protocol for preventing the threats of cybercrimes. Besides this, Money2anywhere provide every customer with a unique 16 digit customer number and password that is used to uniquely identify you each time you visit the website or make any transaction. So, it is the sole responsibility of users to not share these details with any other person. The company is providing enough security to the customers the same as many banks, therefore we rate Money2anywhere 9 out of 10 for its safety measures. The company (www.money2anywhere.com powered by UAE Exchange) is offering its services in 10 countries, where one can send funds to over 30+ countries. One can send money through online mode, phone, cash transfer, with the help of an agent, or bank-account to bank-account transfer. The company is serving more than 15 million people with its network of banks and agents across the world. The company offers various discounts and promotional offers to its customers, which they can use while transferring money. While performing the transaction, one needs to enter the code in “Promo Code” field. The people using the services of Money2anywhere can refer it to other friends to get the discount as well as referral points. The company will provide you with a unique link, which you need to send others. When they complete their first transaction with Money2anywhere, both of you will get the referral points which you can redeem after a limit set by the company. Money2anywhere does not provide any cancellation services. If once you have sent the money, you can’t undo it. You can only contact the customer care if you have been facing any issue while transfer. So, on a user experience basis, we rate 8 out of 10 to Money2anywhere. Coverage: How many Countries & Currencies does Money2anywhere support? The company offers money transfer services around the world from 10 countries which are given in the table below. It has a widespread network of more than 1,00,000 money agent locations and partnership with 140 banks in more than 30 countries. One can transfer the funds from Money2anywhere only through a bank account. If a person living in the USA, then they can do transfers through ACH or direct debit through a bank account. The company also accepts debit and credit card but verifies the identity on your card. The company does not accept third party payment to protect the fraud. The company offers cash pickup and you can locate the nearest agent near you through the Money2anywhere branch locator. On its coverage, we rate 7 out of 10 to Money2anywhere, because it is providing the services to a few countries only and it has a lot of countries to grow its services. To start the fund transfer services of Money2anywhere login here. This is the worst of all Remittance services I have ever used. It takes forever to transfer the money from United states to INDIA. Do not fall for the fake reviews who have given good reviews. I have initiated a request on Aug 29th for cancellation and they took 15 days to even respond to the request. Still no response. Customer care will only respond to the requests that will profit them, they will not respond to the requests that are not profitable for them. They are money suckers. I did a transaction and they were unable transfer it to my account due to their exchange fault. SO they asked me to do another transaction with the same amount so that they can release the amount. BTW they did not inform me about the issue..after two weeks i called them to check then they say that is been rejected. Then it took another 3 weeks to get the money back. Also they deducted 87$ for no reason. They are big lier's. I would like to give negative rating. Customer care is another pathetic. They say they will come back, even after few weeks they will never come back. f&*%king a$$ h0les. Don't use this service. don't waste your time like I did!! Go to the Money2anywhere website. Select the country from where you want to send the money and click on “Get Started”. You can either select bank transfer or cash payout for the recipient. You will be redirected to a new page, where either you can send by logging in or as a guest. Enter all the personal details of your and recipient. Enter the pay-in and payout options. You will see all the details including, transfer rate, fee.